Erakor Golden Star touched down in Honiara late yesterday evening and quickly moved into camp at the Pacific Casino Hotel where they will be based for the week. Solomon Warriors, who are looking forward to the Oceania Football Confederations (OFC) Champions League later this year, are geared up for the friendly match. The friendly today will be followed by two more matches this week on Wednesday and Friday respectively. The times for the second and third matches are yet to be confirmed and the public is informed to check the local media for updates. The Solomon Warriors management has announced that gate fees for the games are charged at the Solomon Islands Football Federation (SIFF) standard for international matches. Grand stand tickets are going for $75 and $50 while hillside tickets are being sold at $20 for adults and $10 for children and students. Tickets are selling at the ITA Hardware shopfront and will also be available at Lawson Tama before the matches. The local champions are expected to field a full strength team which includes the likes of James Naka and Gibson Daudau who have both returned from overseas duty with their former clubs in Fiji and Vanuatu. At the same time seasoned Solomon Warriors representatives are looking to maintain their places in the selection for the OFC Champions League. The same can be said of the visitors who feature the Kaltacks who are rapidly becoming a household name in Vanuatu football. The Kaltack trio of Brian, Tony and Jean are already stars in the region and they will be in action for the first time on Solomon Islands soil this week. The head of the SIFF department, Joseph Boso, is calling on the public to throw their support behind Solomon Warriors by turning up for the match. 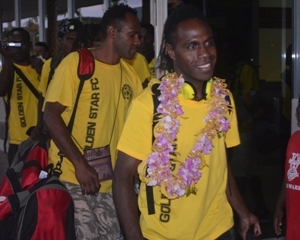 “Solomon Warriors will be representing Solomon Islands in the OFC Champions League so the public must be behind them. By turning up for the friendly matches we are offering much needed support in terms of the gate receipts which in this case go fully to the club,” says Boso. ‘meteoric’ in their home country and was cemented largely by their shock win over national champions Amicale in November last year.